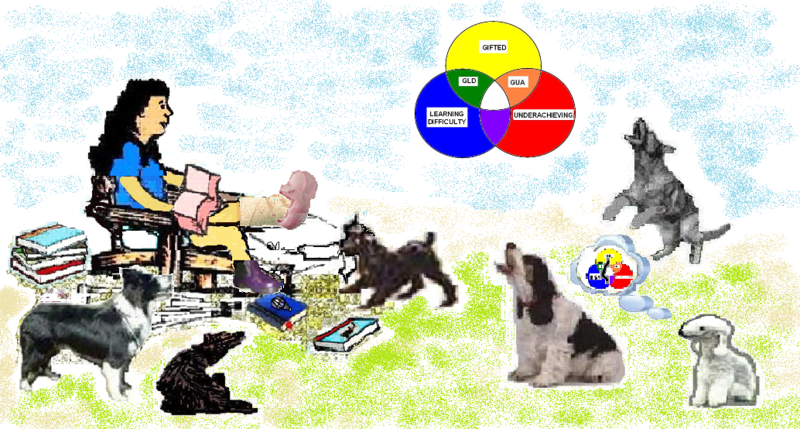 The Dabrowski Dogs gathered round to defend Sprite – all except Psycho Motor who was chasing the bouncing Venn diagram which Little Bully Black Dog had been playing with previously. “It means she is smart enough to do better if she tried harder” said Little Bully Black Dog. “But I always DO try hard” said Sprite. Intellectual called to Psycho Motor to bring the Venn diagram. 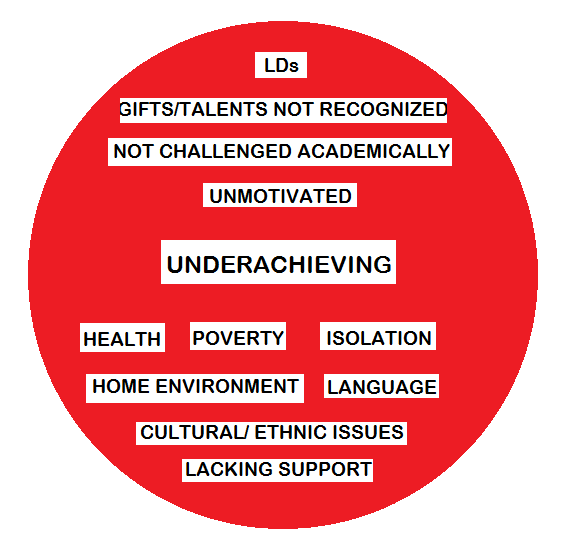 In the whole student population there are some gifted students, some students with learning difficulties and many students who are underachieving for a whole variety of reasons. 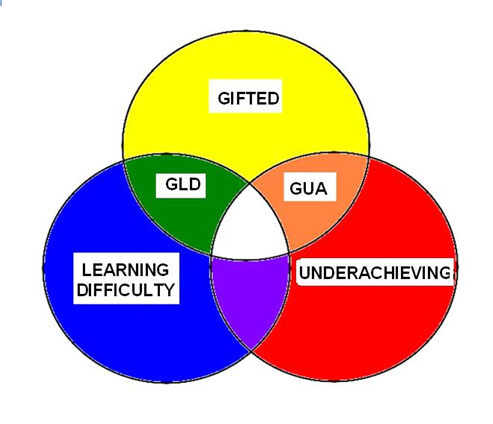 Some of the gifted students also have learning difficulties and many of the gifted and many of those with learning difficulties are underachieving. And some are unfortunate enough to be in that centre group who are gifted with learning difficulties and are underachieving. When we take a closer look at the Underachieving group we see that there are many possible reasons a student can be underachieving. 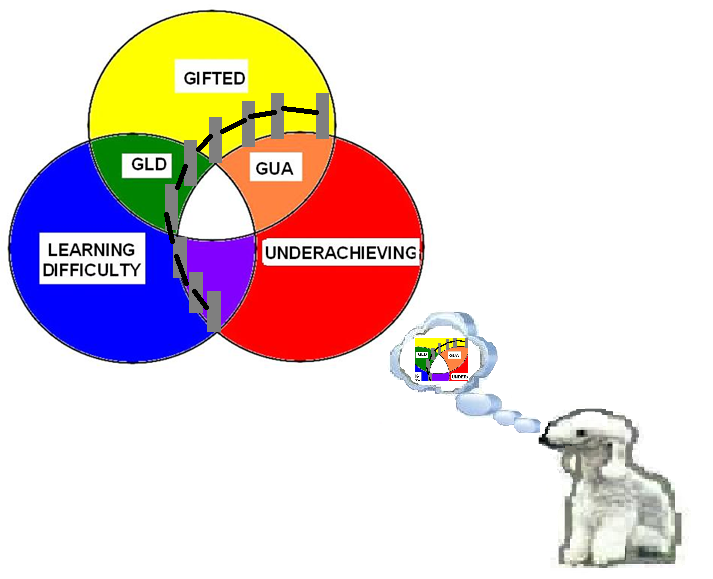 The topic of Gifted Under Achievers was discussed on Twitter #gtchat recently. “So,” said Imaginational “teachers, parents, psychologists, education consultants and therapists need to support and advocate for gifted, 2E and LD students in order to build a guard rail to try to prevent them falling into the Underachieving area. This entry was posted in Uncategorized and tagged Gagne DMGT model, gtchat, underachievement by jofreitag. Bookmark the permalink. I have not met Little Bully Black Dog before, but it would appear that he needs counseling and someone to love him. Sprite is a fortunate young lady to have Jo advocating for her and all the Dabrowski doggies at her side. With all this support, she will grow up to be a wonderful young woman! Little Bully Black Dog is one of the Black Dogs. He starts off by playing nicely but then starts to bully either physically or verbally.